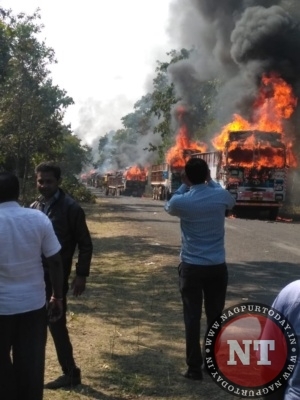 Nagpur/Gadchiroli: At least 5 people were killed while many others were injured when a speeding truck hits an Aheri depot bus heading in opposite direction near Etapalli village in Gadchiroli district on Wednesday morning. Among the dead mainly include school students. Following the accident the people resorted to violence and torched as many as 13 trucks on Surajgarh road. The angry mob has also blocked the vehicular movement on the Surajgarh road.